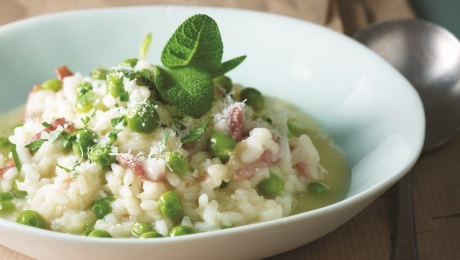 Big flavours with minimum effort with Kevin Dundon's Garden Pea and Mint Risotto. Follow this recipe for the perfect Italian risotto. Peel the garden peas and place in a bowl of salted boiling water, cook for 2 minutes. Choose another wide saucepan with a thick base. On a low heat slowly melt the butter and add the chopped shallots, thyme and cook very gently until completely softened. Add in the Arborio rice and mix well to ensure it doesn’t stick to the base of the pan at this crucial time. Allow the rice to become glazed and cook without any liquid for 3-4 minutes whilst continuing to stir at all times. Next add in the white wine and again, continue to stir the rice because the wine will evaporate off quite quickly. Boil up the stock and add some of this into the rice, the low heat being maintained at all times. Add the stock little by little, never adding the next ladle until the previous one has evaporated. It is vitally important not to rush this process but continue to add all of the liquid until the rice is plump and tender. Season the mixture now and add the garden peas and shred the mint and if you wish to obtain a nice creamy risotto you can add the cream and parmesan cheese now. Adding just parmesan will also generate positive results. Serve immediately with additional parmesan cheese if desired.